Making Spanish real for today’s digital learners! 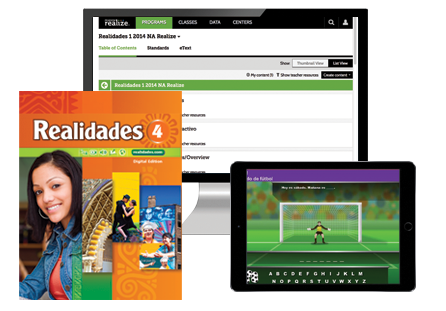 REALIDADES Digital Edition ©2014 now features the most powerful, engaging, and time saving digital resources created for the secondary Spanish classroom. Now your students have instant access to over 6,000+ vocabulary words with accompanying audio files organized around 15 communicative topics! 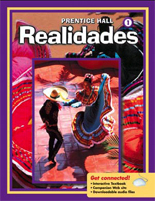 The eText is linked within realidades.com and also available on the Activities and Tools for Interactive Whiteboards DVD-ROM. Interactive Teacher's Edition with Resource Library eText Save valuable time with one-click instant access to all your teacher resources at point-of-use with this new Teacher's Edition eText. If you prefer, you can access all the resources in separate folders. This Teacher's Edition eText is linked on the Teacher Home Page in realidades.com. Finally! Engaging, fun, and challenging activities for your Interactive Whiteboard. We've created 12 activities per chapter to practice vocabulary, grammar, and communication, useable with most interactive whiteboards. The activities can be accessed on the Teacher Home Page within realidades.com. They can also be purchased on separate DVD-ROMs for REALIDADES A/B/1, 2 and 3. These GIS activities zoom your students to locations all around the Spanish-speaking world. 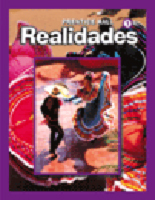 Look for the green globe through the REALIDADES Student Edition or eText for links that bring culture and geography to life! Each link includes activities. Available only within realidades.com. Ever get tired of modeling or acting out the paired practices in REALIDADES? We understand. The Videomodelos feature Spanish-speaking teenagers acting out the various interpersonal speaking activities throughout each chapter. 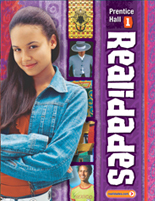 All the video clips are linked within realidades.com or available on a separate DVD. How do you know your students "get it"? You can easily assign the "instant checks" and let the computer do the grading. These short formative assessments let you and your students know if they "get" the new vocabulary and grammar. Available within realidades.com. 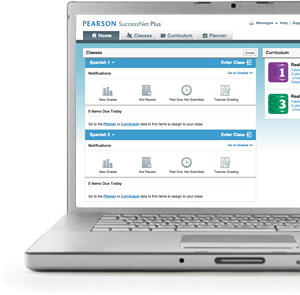 Help your students get better using our Quizzes with Study Plans. We've taken the Pruebas from REALIDADES and converted them to auto-graded quizzes. If a student performs below expectations, the computer automatically assigns remediation activities, and then a second quiz. Both grades go in the Gradebook for your review. Available within realidades.com or separately as Got It! Online Review and Reteaching for Vocabulary and Grammar Digital Courses. Who says review can't be fun? We've created three new games to use as review at the end of each chapter. You assign the game, the students have fun, the computer does the grading, and both you and the students see if they know the vocabulary and grammar. Sweet. Available within realidades.com. No program offers more opportunities to let your students do the talking! With realidades.com ©2014, we've added RealTalk! (our "speak and record" tool) to most of the interpersonal speaking tasks in each chapter. Look for the green RealTalk! icon! In addition, we've converted the Communicative Activities and Situation Cards (in the Teacher Resource Books) as RealTalk! activities. (We already use RealTalk! with Pronunciación, Presentación oral, Examen del capítulo, and the Integrated Performance Assessments.) Available within realidades.com. Connect to online planning, teaching, practice, assessment, and remediation through the many digital resources on our powerful learning management system, realidades.com ©2014!